The outstanding dramatic soprano studied piano n Franz Liszt Music Academy in Budapest , then singing in Graz and summer academy of Bayerische Staatsoper in München under Astrid Varnay. Her career as opera- and concert-singer started in Austria, one of her most memorable performance was in the world-premier of Schubert's opera Der Graf von Gleichen in Styriarte Festival leading by Nikolaus Harnoncourt. With Graz Philharmonic Orchestra she sang among others in Mahler's Symphony VIII., under the baton of Fabio Luisi. She is a regular guest in famous concert halls in Vienna, Musikverein and Konzerthaus. She often serves in Stephansdom in Vienna, she participated in high mass celebrated by Pope Benedict XVI. In Hungary after a successful career as an oratorio-singer she debuted in Fidelio-premier of Hungarian State Opera with Thomas Moser under the baton of Ádám Fischer. In the Palace of Arts in Budapest in June 2009 she sang more roles in the Ring with Ádám Fischer, and in September 2009 she appeared in Britten's The Death in Venice in Theater an der Wien under the baton of Donald C. Runnicles. The excellent coloratura-soprano debuted in 1992 in the Hungarian State Opera as The Queen of Night under the baton of Peter Maag after her triumph in I. International Singing Competition in Budapest. After her studies in Graz she sang in Birtwistle's Punch and Judy in Graz Opera in 1999, and since then she have portrayed such roles like Lucia di Lammermoor, Gilda, Konstanze, Olympia, Zerbinetta and Sophie. She sang The Queen of Night through several season in Hungarian State Opera and in National Theater of Szeged she had great successes as Lucia and Titania (Britten: The Midsummer Night Dream). She performed R. Strauss's Four Last Song in Bayreuth with the preparation with the great Wagner-tenor, Manfred Jung. The famous mezzo-soprano won III. Prize of Wigmore Hall International Song Competition and appeared in Europalia in Bruxelles with the Hungarian Radio Orchestra under the baton of Tamás Vásáry in 1999. Her most famous role is Judit in Duke Bluebeard's Castle: she often portrays it all over Europe and the world (among others in Teatro Massimo in Palermo, in Barbican Hall in London, in the Palace of Arts and from the last season in Stuttgart Opera) and she sings in the Naxos-recording published in 2007. She sings in Hungarian State Opera from 1998, beside Judit she often sings Dorabellát, Sesto, Rosina and Orlovsky. Newly she had outstanding successes in Serse and in Die Rosenkavalier. Among her numerous CD Galuppi's La clemenza di Tito (under the baton of Fabio Pirona, Hungaroton) and Mozart's Don Giovanni (with Ferruccio Furlanetto and László Polgár, under the baton of György Győriványi Ráth György, Vox Artis) could be excepted. She is a significant artist as an oratorio-soloist, she won Artisjus-prize for 8 times for her commanding activity in the field of contemporary Hungarian music's interpretation. From January 2009 she is a department chief in University of Pécs. The American-born lyrical tenor lived in Hungary between 1995 and 2006. He has sung in Hungarian State Opera since 1998 and he often sings in concerts, among others with the National Philharmonic Orchestra and The Symphonic Orchestra of Hungarian Radio. Her repertory ranges from the baroque to the contemporary music and his appearances are exciting also as theatrical aspects. She played more than 30 roles, his most unforgettable portrayals: Nero (L'incoronazione di Poppea), Nemorino, Edgardo, Alfredo, Tom Rakewell and the Mozart-heroes (Belmonte, Ferrando, Don Ottavio, Tamino, Titus), in which he has special appreciation. He appeared with Strasbourg Philharmonic,Warsaw Philharmonic, Sophia Philharmonic Orchestra, Saint Petersburg's State Philharmonic Orchestra, Lille Philharonic, Avignon Philharmonic and New Israel Chamber Orchestra. He made numerous CD-s with Hungaroton and in the edition of Naxos he sings in the recording of Mahler's Symphony VIII. with Warsaw Philharmonic. He is the founder and artistic leader of Crescendo Summer Institute and the president of Song for the Nations Cultural Foundation organizing the Summer Institute. She is a singer and a teacher at the National Conservatory in Lisbon. Born in Estoril where she began her musical studies.She began studying singing technique with Prof. Elizabeth Bayan. She continued her studies in vocal technique and interpretation Tartini Conservatory in Trieste with Santé Rosolen and both attended the summer courses of RAI with Elisabeth Schwarzkopf. Later she was a student at the School of Singing in Madrid, having been a disciple of Lola Rodriguez Aragon, with whom she made artistic development. She is a musical assistant in Hungarian State Opera. After her studies as chorus master and cemballist she became the member of her mother-theater in 1990. She is also active in early music and plays regularly with the Capella Savaria Baroque Ensemble and Aura Musicale Baroque Ensemble in addition to many concerts of chamber music and song. She often participates in concerts as cemballist and pianist. In 2009 she was artistic leader and conductor of the production of Crescendo Summer Institute, Haydn's Le pescatrici in Ede Paulay Theater in Tokaj. Kristin Ditlow, piano, vocal coach, is a graduate of the Oberlin Conservatory of Music and Westminster Choir College. She has performed as a soloist and collaborative pianist throughout the United States and abroad, including appearances at Philadelphia’s Kimmel Center for the Performing Arts, Lincoln Center, Tanglewood, and Carnegie Hall’s Weill Recital Hall. She is the winner of the 2004 Peggy Rockefeller Memorial Fellowship at the Tanglewood Music Center, and the Princeton-Pettoranello Sister City Foundation Baccalaureate Grant, and has studied and performed in both England and Italy. In addition to her solo appearances and recordings, Kristin performs with the Lukens Piano Trio, teaches at the Curtis Institute of Music, and works with the Opera Company of Philadelphia. Tina Bailey is an extraordinary all-round personality: painter, actor, dancer and she also graduated as a theologian. She was a member of “The Company Theater Group” as a dancer and actress for four years and has had extensive experience in liturgical dance. Tina has also used visual and performing arts in response to trauma situations: through dance following the Bali bombings, and visual art following the Asian tsunami. She has also led small groups incorporating drama, dance, music, visual arts and discussion. She finds great joy in helping people discover how to connect with their creative potential. In the last year she was the choreographer of the production of Crescendo Summer Institute, Haydn's Le Pescatrici premierred in Tokaj . Moyer is a Professor of Music and the Associate Director of Theatre, specializing in Vocal Studies at Eastern University. She holds a Master of Music degree in Opera Performance and an Artist’s Diploma in Voice from the Curtis Institute of Music, as well as a Bachelor of Arts degree in Music Education from Rutgers University. Ms. Moyer has performed the roles of Cousin in Puccini’s Madama Butterfly, and a Witch in Verdi’s MacbethOpera Company of Philadelphia, where is is a twenty two year veteran of the opera chorus. Ms. Moyer also performs regularly with The Philadelphia Singers Chorale, the symphonic chorus of the Philadelphia Orchestra. She participated for several years in Il Festivale dei due Mondi in Spoleto, Italy, under the Artistic Direction of Gian Carlo Menotti. While in Spoleto, she also performed the role of Maid in Stravinsky's The Nose. Professor Moyer initiated and leads the Opera Workshop and Musical Theater program at Eastern University where she has directed numerous productions. In addition to her work at Eastern, Ms Moyer maintains a private voice studio in her home in West Conshohocken. She is a member of the Vineyard Community Church in Chester Springs, PA, where she and her husband Stephen serve on the worship and church leadership teams. She was born in 1975 in Berlin. She started playing the violin at six years old, after three years of piano lessons. In 1990 she became Zakhar Bron’s student in Lübeck, than she continued her studies in Köln with Victor Tretjakov, where she attended the Alban Berg Quartette’s chamber music trainings. In 2000 she studied with Dorothy Delay at Julliard Academy in New York. She had her debut in the concert hall of the Berlin Philharmonic, followed by many concert invitation: Alten Opera in Frankfurt, Concertgebouw in Amsterdam. The violinist of Prague Philharmonic, David Danel has a significant career also as a soloist: he appeared with Janacek Philharmonic Orchestra, Ostrava Orchestra, Capella Istropolitana in Slovakia, Prague Philharmonic Chamber Soloists and Talich Chamber Orchestra in Prague. He has made many recordings of solo and chamber music for the Czech Radio and Slovart Records. He has received prizes in several national and international competitions including the Ludwig van Beethoven International Violin Competition and the Leos Janacek Violin Competition. He enjoys looking for ways to bring the violin into new mediums, and often cooperates with dancers, choreographers, visual artists and narrators, and frequently premieres new works by Czech composers. Beside his artistic career he teaches at the University of Ostrava. Attila Füzesséry took an honors degree 1997 as violinist-teacher in the Hungaian Franz Liszt Music Academy, as the student of András Kiss. He was a member of the Hungarian National Symphony, presently plays in the orchestra of the Hungarian State Opera and the Budafoki Dohnányi Ernő Symphonic Orchestra and is the concertmaster of the Pest County Symphonic Orchestra. Also active as a soloist and chamber musician, he is a member of the HÍD Chamber Ensemble, Sárospatak String Quartett and the Violinetta Duo founded with his wife, Eszter Dudás. The Violinetta Duo won the prize of ARTISJUS Musical Foundation for their commanding activity in the field of contemporary Hungarian music's interpretation. He has taught in Crescendo Summer Institute in Sárospatak since 2004. With the support of Royalty Fund of Performers he was invited in East-Helsinki Music Institute. A wealth of experience as a professional violinist over 30 years combines with a passion to communicate in John's music-making and teaching. His interests range from solo recitals, quartet and orchestral leading to folk music, jazz, and improvisation. My second visit to teach at Crescendo Summer Institute! I hope to have an “open class” where students can observe most individual lessons. top tip, if you smilennnnnnnn. Important information John is Dad of 3, Grandpa of 1 Married to Jane Loves: making bread, puppets, growing things to eat, spicy food, talking with people, antiques. Hates: paperwork, fast food, traffic jams and creme caramel. Eszter Dudás violist, she received her diploma from the Liszt Ferenc Academy of Music in 1999, as the student of László Bársony. She played in National Philharmonic Orchestra and in the MATÁV Symphonic Orchestra, she often participated their European concert-tours. Currently she is a section leader and soloist of Pest County Symphonic Orchestra and member of the HÍD Chamber Ensemble, Sárospatak String Quartett and the Violinetta Duo founded with his husband, Attila Füzesséry. The Violinetta Duo won the prize of ARTISJUS Musical Foundation for their commanding activity in the field of contemporary Hungarian music's interpretation. She taught at the Vác Music Conservatory from 2000 to 2004, from where her students got into the Franz Liszt Music Academy in Budapest and its departments in Debrecen and Szeged. How she teaches viola at the Kőbánya Music School where she is also the conductor of the orchestra. Her students won numerous prizes in solo- and chamber music-competitions in Budapest and Hungary. In 2004 from the initiation of Timothy Bentch, in her native town, Sárospatak, they founded Crescendo Summer Institute, in which she is a leading teacher. From September 2006 she is the director of Song for the Nations Cultural Foundation organizing the Summer Institute. With the support of Royalty-base of Performers he was invited in East-Helsinki Music Institute. Ellen Rose, a Juilliard School graduate, has served as Principal Violist of the Dallas Symphony since 1980. She has performed as recitalist throughout America and Europe, and she has appeared in chamber music performances with Itzhak Perlman, Pinchas Zukerman, Yo Yo Ma, Lynn Harrell and Ralph Kirschbaum. She premiered and recorded numerous contemporary works. As a fund raiser, her annual "Ellen Rose and Firends" chamber music concerts has raised funds for the cancer unit at Children's Medical Center of Dallas and her group is currently benefiting The Nelson Center, a home for abandoned, abused and neglected children. She is on the Viola Faculty at Southern Methodist University and teaches professional musicians throughout the country. She is on the Advisory Council for the DSO'S Young Strings Project. Some master classes include The Juilliard School, Cleveland Institute of Music, Oberlin Conservatory, University of Michigan, and The Manhattan School of Music. She has written several transcriptions and arrangements, magazine articles, and has written two books, Viola Excerpts PLUS, and a scale book called EXTREME VIOLA. Kertész, later earning an Artistic Diploma with honours as a pupil of Miklós Perényi. and soloist diploma with distinction at the Basel Music Academy in Ivan Monighetti’s class. position at the University of Debrecen In Hungary. symphony orchestras, including the Basel Symphony, Mendelssohn, Liszt, Schengen Chamber Orchestra. Anna Kuvaja she was awarded a prize at the Orpheus Festival In Zurich In 2008. Schiff, Ferenc Rados and Frans Helmerson. cello concerto. She received a prize from Artisjus in recognition of her work with contemporary music. The young cellist, Lauren Franklin began studying piano at the age of two and cello at the age of nine, and made her solo debut as a cellist with the Jacksonville Symphony Orchestra in Jacksonville, Florida, at the age of sixteen. She received Masters degree from Manhattan School of Music. She appears as a soloist and chamber musician throughout the United States and Europe, among others in the Carnegie Hall. She is a frequent performer of new music. Endre Balog is principal cellist in the Hungarian Virtuosi, Sonora Hungarica Chamber Orchestra and the Arpeggione Chamber Orchestra. He regularly appears in the Budapest Festival Orchestra, Luxemburg Symphonic Orchestra and the Malaysian Sym-phonic Orchestra. He has been principal cellist of the Opera of Sao Paolo and Brazil Symphonic Orchestra. A graduate of the Béla Bartók Music College and the Liszt Acad-emy in Budapest, he has worked with the Amadeus String Quartet in London. As founder of the Amabile String Quartet, he is the First Prize Winner of the Weiner Leo National String Quartet Competition. Endré is currently on the faculty of the Richter János Music College in Győr. The well-known Swiss flautist, Christian Studler is a winner of numerous competitions earlier in his career, he studied with Aurele Nicolet, Marcel Moyse, and James Galway. As a flute soloist he has played under such conductors as Marcello Viotti, Okko Kamu, Gustav Kuhn, Peter Gülke, and Ivan Anguélov. He has been the solo flutist with the Bern Symphonic Orchestra since 1979 and also professor of music at the Music University Bern since the same year. József Kiss, oboe was born in Sátoraljaújhely, Hungary in 1961. He graduated from the Liszt Ferenc Academy of Music in 1986 where he studied with Péter Pongrácz. He has now taught at the same institution for over 20 years. In 1984 he won the "Bronz Medaille" in the Touloni International Oboe Competition and he won the Grand Prize of the Hungarian Radio National Woodwinds Competition. He was the first oboist with the Hungarian Radio Symphonic Orchestra for almost ten years. From 1992 to 2009 he was the principal oboist with the Hungarian National Philharmonic where he was twice awarded "Artist of the Year" in 1998 and 2001. Since 1997 he has been a guest professor at the Tokyo Musashino Academy of Music. He was a member of the Budapest Woodwind Ensemble and the New Budapest Woodwind Quintet. In 2005 he was awarded the prestigious Liszt Prize by the Hungarian Government. Presently he is a tenured professor at the Liszt Ferenc Academy of Music and also a professor at the Detmold Hochschule für Musik. He has made many solo and chamber music recordings with the Naxos and Hungaroton recording labels some of which can be heard with the partnership of pianist Jenő Jandó. He has worked with the many prestigious conductors including George Solti, Antal Doráti, János Ferenscik, György Lehel, Zoltán Peskó, Gennagyij Roysgzesytvensykij, Lamberto Gardellivel, Giuseppe Patanéva, Kobayashi Ken-Ichiróva and Ádám Fischer. Born in Hiroshima, Koji Okazaki began his study of the bassoon at the age of sixteen and had his professional training from 1968 to 1972 at the Musashino Academy of Music, thereafter joining the Tokyo Symphony Orchestra. A second prize winner at two of the NHK/MaiNichi Music Competitions, he was awarded the Deutsche Akademische Austauschen Dienst Fellowship in 1974 and embarked on a course of study at the Nordwestdeutsche Musikakademie in Detmold, undertaking concert-tours and recordings as a member of the Detmold Wind Ensemble. A prize- winner in the Trio Class at the Colmar International Chamber Music Competition, he graduated with the highest distinction in 1978 and was immediately invited to take up his present position as principal bassoonist of the NHK Symphony Orchestra (the top orchestra in Japan) in Tokyo. He also serves as a member of the teaching staffs of the Musashino Academy of Music, Elizabeth Music University, and is professor of bassoon at the Tokyo Univeristy of the Arts. Julian Poore was taught to play by John Knight, the founder of the Hampsire County Youth Band. With additional help from Ernest Piper and Chris Kennett he qualified for study at the Guildhall School of Music and Drama with Horace Barker, Ray Simmons and John Miller. In 1982 he became a member of the Chamber Orchestra of Europe, which has taken him all over the world. Highlights have included Beethoven cycles in Salzburg and New York with Nikolaus Harnoncourt, Schubert cycles in Salzburg and Japan with Claudio Abbado, Rossini operas with Abbado, a Sibelius cycle in Finland with Paavo Berglund, and the many world-class soloists he has had the privilege to accompany. The continually varying challenges of a freelance music career help keep Julian’s life interesting and stimulating. He once spent a week in a BBC recording studio playing conch shells. On another occasion the expected cue was not given, and the Queen was kept waiting for her fanfare! His solo repertoire includes Haydn, Hummel, Vivaldi, Neruda, Copland, Aratunian, including a recording of Shostakovitch’s Concerto for Piano, Trumpet and Strings with pianist Steve Robbings and the New English Orchestra. In 2006 he performed with Andrew Lumsden as part of the Winchester Festival. Julian teaches at Peter Symond’s, Winchester College, St Swithun’s, Pilgrims’ and Southampton University, and directs the band and choir at the Salvation Army in Alton. Born in 1952 in Pittsburgh to musician parents, Gregory Pascuzzi studied composition and conducting with Karel Husa, Frank McCarty, Henry Mazer, Manuel Alverez and Sheldon Morgenstern. Anthony Pasquarelli was his main trumpet teacher. His music (original and arragements) has been played by many orchestras, soloists and chamber ensembles around the world. Gregory Pascuzzi served 27 years (1972-1999) with two major American military bands (US Military Academy Band at West Point and the US Army Field Band in Washington) as conductor, composer, arranger and musician. He also was co-director of Music at the Bishop Cummins Memorial Reformed Episcopal Church in Baltimore. A wide range of influences has resulted in an eclectic output. Early influences included the wind band traditions of America, England (Sousa to Husa), 20th century composers ranging from Vaughn Williams to Penderecki, jazz and big band composers and arrangers (Thad Jones, Don Sebesky, Stan Kenton, etc. ), film score composers, and, occasionaly, even PDQ Bach. A third of it is sacred music. Irena Marie Rieband was born in Nottingham, United Kingdom. She was taught by Derek Taylor at the Royal Academy of Music from the age of 14, went to The Purcell School and graduated from University of London with First Class Honours in Music, German and Performance. Subsequent teachers included Julian Baker in London, as well as Fergus McWilliam, Theo Wiemes and Frøydis Ree Wekre abroad. Having worked as university lecturer, in corporate communications and as assistant orchestra manager in Germany, Irena moved to Poland in search of her Polish roots, returned to professional horn playing and completed her masters at the Gdansk Academy of Music in 2008. Her writing and teaching is dedicated to the prevention of performance-related ill-health, recently published in England and the United States. She has been invited as a guest lecturer at the RNCM in Manchester, and will be giving workshops in the UK, Germany and Poland. Irena is currently principal horn of the Filharmonia Sudecka in Poland where she also performs in chamber music and as a soloist. István Dominkó, pianist, received his diploma from the Liszt Conservatory of Music and is professor of piano at the Eötvös University in Budapest. He is a candidate for a doctorate in piano and is active as a soloist and chamber musician. He is the founder and director of the HÍD Chamber Ensemble and performs regularly in the Budapest Spring Festival. Studied piano at the Music School-Lyceum of Kishinew, at Musicescu Academy of Music with professor Covalenco, at Rimsky-Korsakov State Conservatory (Saint-Petersburg) with professor Nilsen. In 1979 won 1st Prize in Moldova National Competition of pianists, in 1980 got the Honors Diploma, BM of Musicescu Academy of Music; in 1985 - the Honours Diploma, MM of Rimsky-Korsakov State Conservatory. 1985 - 1994 taught piano at Musicescu Academy of Music, prepared 18 graduates (BM). 1994 - 1996 taught piano at Herzen University, St.-Pb. As a soloist he gave concerts in Austria, Iceland, Moldova, USA, Germany, Hungary, Israel, Italy, Northern Africa, Romania, France. Performed with conductors S.Muni (USA), V.Piccolo (Italy), G.Mustea (Moldova), A.Polyanichko, L.Dunayev (St.-Pb), G.Costin (Romania). Participated with T.Bentch, M.Bender, M.Merritt, S.Streseva (USA), E.Barbian (Germany), M.Bieshu and M.Munteanu (Moldova) in chamber concerts. A native of Budapest, László Fassang was born into a musical family and began to study the organ at the age of 13 under the tutelage of István Baróti. He graduated from the Franz Liszt Academy of Music in 1998, having studied piano under Ilona Prunyi and organ with István Ruppert. Mr. Fassang then entered the Paris Conservatory, where he studied organ with Olivier Latry and Michel Bouvard, as well as improvisation under Loic Mallié, Philippe Lefebvre, Thierry Escaich and Jean-Francois Zygel. Gergely Kaposi is a leading conductor at the Hungarian State Opera. He was the music director of the Debrecen Csokonai Theater and since 1998 has been the lead conductor for the Ferencváros Summer Performances, conducting such operas as Nabucco, Bánk Bán, and the Magic Flute. Since 1998, he has been the conductor for the annual Budapest Ball. Outside of his native country, he has conducted in Germany, Italy, Japan, and Italy. Also active as a pianist, he has performed many concerts with singers and chamber ensembles. He is a graduate of the Liszt Ferenc Conservatory of Music where he studied under Ervin Lukács. He has been the conductor of the Liszt Ferenc Academy of Music Orchestra since 1997. Csilla Sallai, cello, is a graduate of the Liszt Ferenc Conservatory and studied at the Santa Cecilia Conservatory in Rome. She was a founding member of the Erkel Ferenc Chamber Orchestra and presently teaches at the Tóth Aladár Music School. She has given solo concerts in Rome, Sicily, and Berlin. Katalin Paulay completed her studies at Liszt Ferenc Music Academy in 1992. Her teachers were: Valéria Baranyai, István Kertész and Viktória Szilvássy. She is a member of the Erkel Ferenc Chamber Orchestra since its founding, 1986. Katalin Paulay together with the Erkel Ferenc Chamber Orchestra won prises at many competition and has been on tours all over Europe as well as in China. They had been created numerous records through the 26 years and gave concerts with soloists like Leonidas Kavakos, Miklós Perényi, Barnabás Kelemen, Katalin Kokas, Sylvia Sass, Lajos Lencsés. Katalin had been teaching in the Újpest Music School and she is performing regularly in various chamber arrangements. At present she is a violinist at Óbuda Danubia Orchestra, and Concerto Budapest. 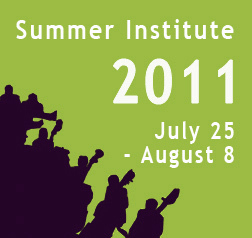 Katalin Paulay is invited as teacher for the Youth Chamber Section at Crescendo Summer Institute in 2011. She started her musical studies at Bartók Béla Music School in Budapest, than she continued her studies at the Liszt Ferenc Music Academy’s Institute for Music Teachers and at the Academy of Music in München. From 1990 until 2002 she was musical assistant at Bartók Béla Music School for the flute and bassoon department. From 2002 she became the musical assistant of the Liszt Ferenc Music Academy’s Institute for Music Teachers for flute department. She also works as assistant professor at the Theatre and Film University’s Music Department. Christian Radelhof Studied accompaniment in Franz- Liszt- Conservatory in Weimar 1984-1989, from 1989 he is an accompanist in State Ballettschool of Berlin (Staatliche Ballettschule Berlin). He regularly appears with singers. Since 2005 he is accompanist at Crescendo Summer Institute. András Dér is one of the leading Hungarian film directors. His films have won top prizes in the New York, London, Mannheim, and Aix-en-Provent film festivals. In Hungary he was awarded the prestigious Balázs Béla prize. Also active as a theater director, he has directed such plays as Shadowlands, The Angel's Greeting, A. Gelman’s Bench at the Hungarian Theater, and Arthur Miller’s The Crucible at the Vörösmarty Színház in Székesfehérvár.